The Chapter starts with Cheval, he has gone back to where Mille and Hyoro are, he has come riding his Velocidrome. Mille ask him why he didn´t came with Leia? Cheval just says that he got rid of his Rathian for being useless, so he won´t be talking more about such unimportant topic. Suddenly Dr.Manelger and Itsy-Bits arrived! They have great news for Cheval, the group enters in Manelger´s Ship and in there he shows Cheval his new invention, using the shard taken from the second Kinship Ore hidden on Hakum Village, he is making his own Kinship Stone, one that will surely hatch the White Dragon´s Egg!... Although there it is a little problem and it´s that they don´t know when such stone will be ready. So in the meantime he can go and do whatever he pleases. After that Cheval and his team went to the desert´s village Hunter Guild, they are asking for information, well Cheval is…Mille and Hyoro feel really uncomfortable on such place since it is a Pub. In any case the Lady Hunter who helped them on the whole Blighted Diablos business enters and gives them a hand, so the Hunters stat giving information to them. They say that there has been a Black Diablos who has been a real problem for the Hunters, that was what they were searching for… After that Cheval takes his group to another place. A Nargacuga is in front of Cheval, He orders Mille and Hyoro to chase him away! Hyoro and Mille call for their Monsties and they attack the Nargacuga until such Monster decides to leave back to it´s nest, Cheval follows it and grabs the egg, he makes the hymn and the egg hatches, a Nargacuga is now his new Monstie! Hyoro ask if he is sure that such creature to be his Monstie? Since a Nargacuga killed his Mom, and all that; but such words have no weight for Cheval. The team goes back to the desert, near some Cactus, the favorite food of the Diablos. They make camp and Cheval asks Mille if they have enough supplies? She says that yes, the have, a lot of potions and other stuff, so they are ready to fight the Blighted Black Diablos! On the night, Cheval was having another nightmare about her Mom, and the sad fate she got. The next day the Black Diablos appears, and she is Blighted! The Black Diablos, a some form of sub species of the Diablos, it is basically a female Diablos that it´s on her mating season, ergo, she is horny and very, very angry. She is more violent than a normal Diablos, so one needs to be waay more careful for her attacks! Cheval rides his Nagacuga, Mille and Hyoro does the same for their Tigrex and Monoblos respectively! The fight starts and Cheval orders his Minio… Err, Team mates to distract the Black Diablos while he prepares an attack! Mille and Hyoro aren´t so hot on such Idea; but they obey nonetheless! Mille threw some rocks to the Black Diablos, although this Monster didn´t flinch at all! Cheval attacks it again with his Nargacuga and does some damage! The Monster start chasing him; Mille and Hyoro goes after it and gets damaged in the process! Cheval manages to stuck the Monster on a hard rock, Hyoro and Mille takes the chance and do their Kinship attack! The Black Diablos free herself and attacks them! Cheval takes the opportunity and makes his Kinship Attacks killing the Blighted Monster! 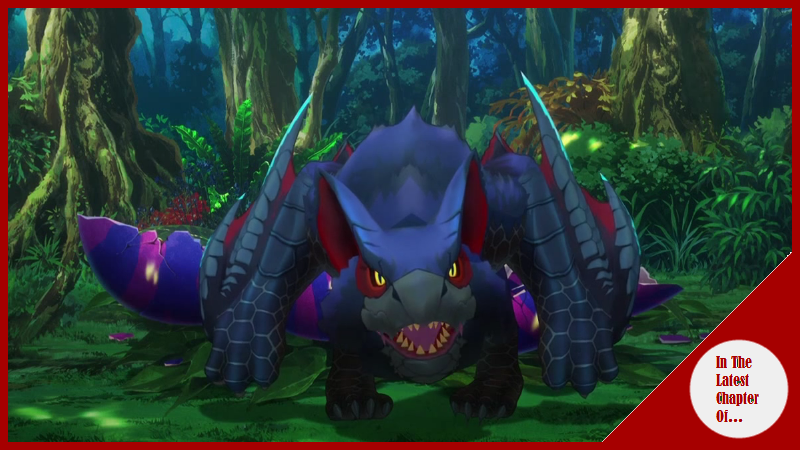 The Nargacuga, Mille, Hyoro and their Monsties are tired; but the job has been done, the Blighted Monster has been eliminated. Suddenly, a Diablos appears, it is not blighted. Mille and Hyoro says that they can leave it alone, that Monster is normal, there is nothing wrong with it. The eyes of the Monster and Cheval´s ones meet. Cheval demands to his Team to help him eliminate such Monster! It is Blighted! He says, Mille and Hyoro respond saying that he it is not blighted! Cheval responds by saying that this Monster will be Blighted anyway! The best option is to kill them before they get Blighted! Cheval goes with his Nargacuga, the Monsties are tired and they can´t do much! At the same time Mille and Hyoro gets damaged by the Diablos! Still Cheval is able to pull another kinship attack, weak; but hey its something! In any case he see that Mille and Hyoro are resting, just watching, he demands them to come and fight! The Diablos gets away and he orders the Nargacuga to follow it; but the Monstie is too tired to do anything. After that he says that this Monstie, like his Rathian, is Useless and he has no place for creatures like those, so he will let him go! After that he goes to where Hyoro and Mille says and they say that it is the same for them, they are Useless and worthless! He doesn´t need them anymore, so they can go! The night comes and none of the Team talk with each other, Cheval goes to sleep. Mille and Hyoro are talking and they are seeing the changes in Cheval; but even more the fact that he is just looking and using them as Minions, in truth he has changed. Hyoro starts crying since he sincerely believed that Cheval was a friend; but he is not, Mille goes and comforts him. Meanwhile Cheval is sleeping, he is having the memories of his Mom and her fate… He wakes up and the Dawn has come, he looks his surroundings and the tents of Mille and Hyoro are nowhere to be seen, he yells their names; but there is no response… Effectively, they have left him alone. A very good chapter! The various fights we see where intense! At the same time we could see how Cheval is going into an endless void and he is the one responsible for his situation, since he has drove away everyone who loves him or wants to be near him, Monsties, humans, everyone is being chased away by his own corruption and…Yeah, dementia. Talking more on that topic, such thing was interesting and in a way it sorts of makes me wonder if the one corrupted here is Cheval… Like he has, or will be affected by the Blight, since remember that it was said before that the Blight could affect humans, although it was still a mystery in how such humans will behave in such state, and I am mostly sure that Cheval is going crazier and crazier and maybe the fact that he is corrupted by such things is the reason why he is going in such self-destructing quest. At the same time it was quite good to see Mille and Hyoro again! And I know that they will come back, when the time comes… I know they will help Cheval, not on this endeavor; but on a different one, in one to help him heal himself.